Chrome is Taking Forever to Download Files? Use Steadyflow! One of the main problems I face while using Chromium is that most of the time downloads break half way and I have to start from beginning. Also, the pause/resume function is poorly supported as it simply fails where Firefox perfectly pauses/resumes downloads with ease. However, I got the problem solved by using Steadyflow download manager, which we covered only few days back. Now there is a Chrome/Chromium extension for it which allows us to directly download files in steadyflow download manager. 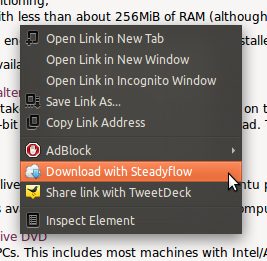 Steadyflow also comes with appindicator support for Ubuntu 11.04. Download Chromeflow Chrome/Chromium extension from here and just drag 'n' drop it on browser window to install it.